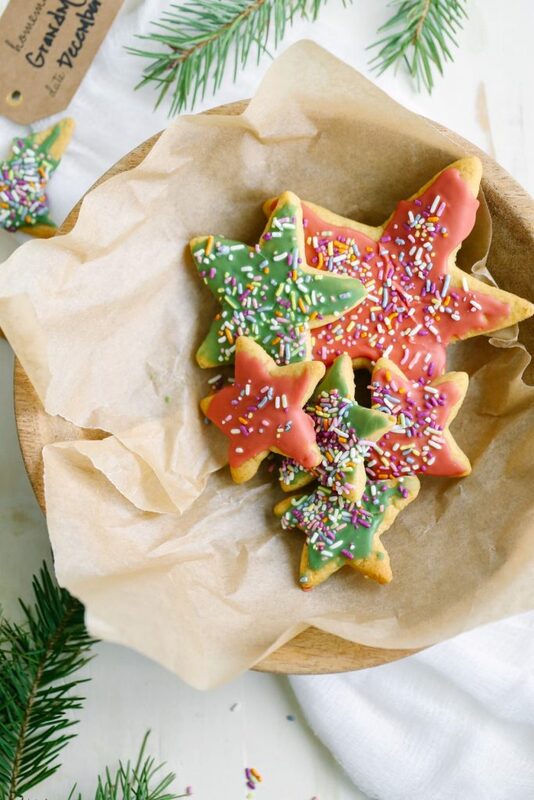 ‘Tis the season for cookies, and lots of them. 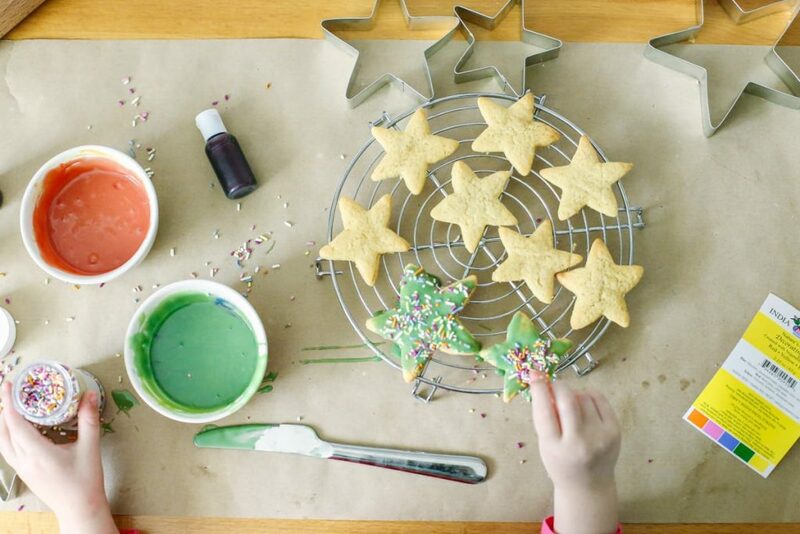 Growing up, Christmas cookies were a BIG thing in our house. Once the tree was up, the endless baking would begin. In the late evenings of December, my mom and I would spend our time together baking every variety of cookie imaginable: buckeyes, sugar cookies with lots of icing, Spritz cookies, Russian tea cakes, and so much more. By December 24th, my mom’s freezer was always packed full of santa tins filled with our creations. The best part of the baking experience was pulling the tins out of the freezer on Christmas morning to share with our family and friends. 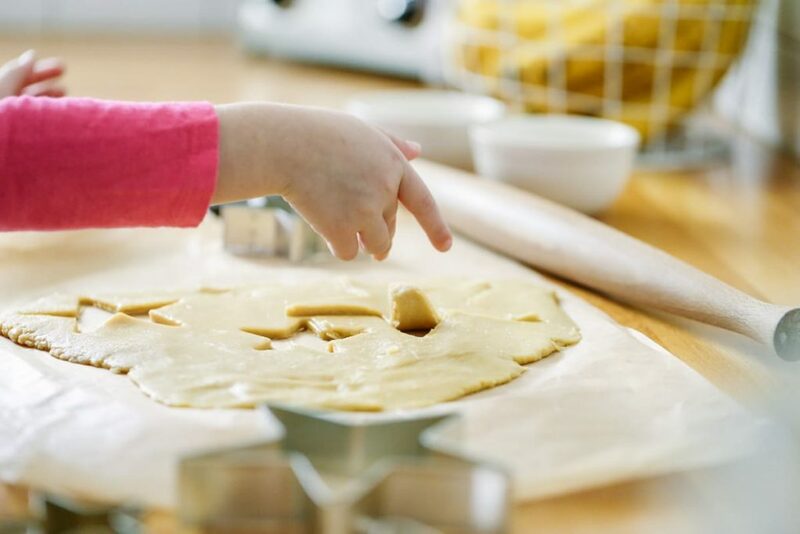 Now that my kids are old enough to enjoy baking and cooking, I’m returning to the cookie memories I hold dear from my childhood in an effort to create new cookie memories with them. 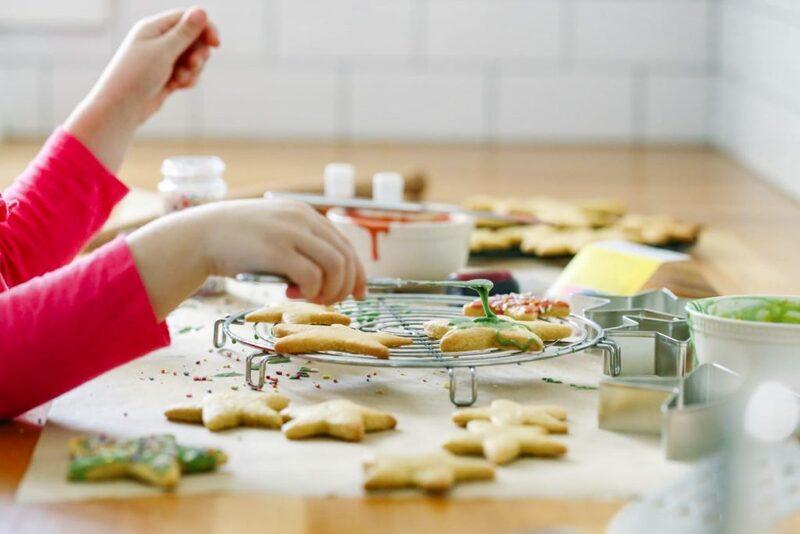 But there’s one problem: most of my favorite Christmas cookies from my childhood require highly-processed ingredients; ingredients I don’t want to bring into my home. 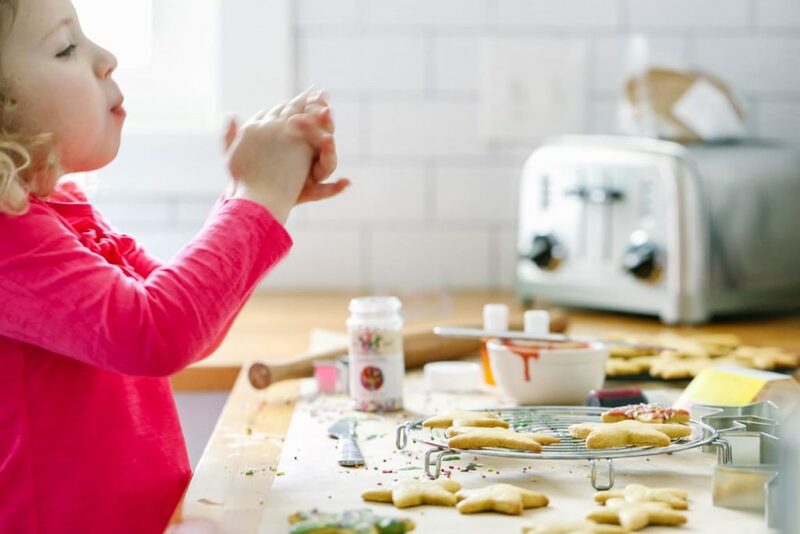 With a desire to keep our food as unprocessed as possible, I’ve been working on reinventing classic Christmas cookies so I can pass the recipes (and memories) down to my children. First on my “reinvent list” is the classic sugar cookie. Sugar cookies are a huge offender when it comes to processed ingredients, particularly store-bought doughs and frostings. Since this is a season for being cheery, I’m not going to dive into the list of ingredients on a sugar cookie package (or the really bad stuff, frosting! ), so you’ll just have to heed my word: stay far away from the store-bought dough and frosting! 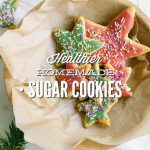 The good news is that a “healthier” real food sugar cookie is easy to make with a few basic less-processed ingredients. Einkorn is known as the oldest variety of wheat making it an “ancient” grain. The ancient grain is believed to have originated in the Tigris-Euphrates region and is possibly the main grain referenced in the earliest accounts of the Bible. To put it simply, einkorn is the wheat men were eating in the earliest days before modern-day wheat varieties. While modern wheat has undergone hybridization, einkorn still holds true to its original properties. Einkorn is slowly gaining popularity, but is still grown in only a few regions in Europe. The sweet, ancient grain has a lighter texture and taste than modern-day wheat, and contains a more favorable gluten ratio. People with minor gluten sensitives may be able to consume einkorn without the issues associated with whole wheat due the lack of D-genome, however, einkorn is not gluten-free. Einkorn is packed with nutrition, containing high levels of protein along with the antioxidant beta-carotene lutein and minerals. Einkorn looks and tastes similar to white flour, so it’s the perfect healthy flour to use when making sugar cookies. Einkorn is sold in some health food stores and online. 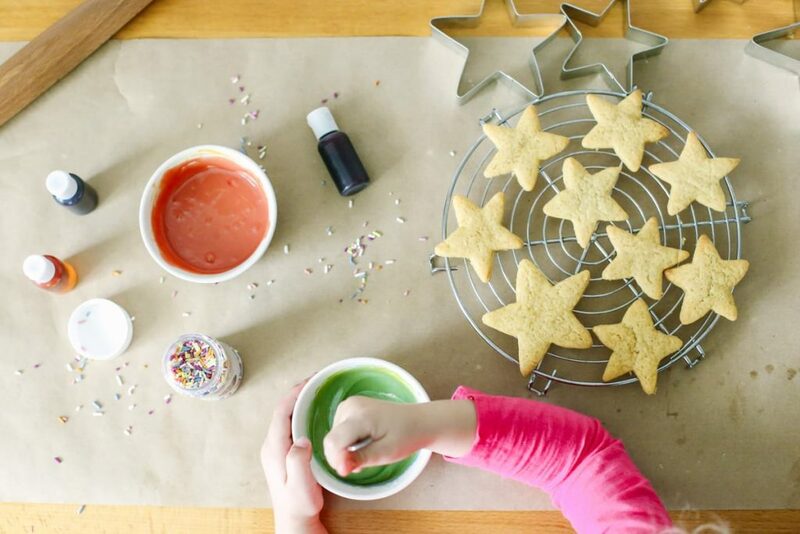 Sugar cookies are little works of art, so naturally a good sugar cookie recipe needs frosting (yep, I use sugar to make the frosting…balance, my friend) and pretty dyes. Artificial dye is an ingredient we avoid using in our food. Thankfully, there are a few great dye alternatives that are made with real ingredients (from vegetables). My favorite store-bought brand is India Tree, which can be purchased online or at health food stores. The price of natural dye is hefty, but a little bit of dye goes a long way, making the price a bit more affordable. I purchased a 3-pack of India Tree Dye from Whole Foods for $18.99. The same set sells on Amazon for $31.00. India Tree also makes sprinkles using plant-based dyes. 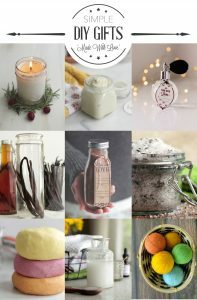 Another option is to make plant-based dyes at home (find a recipe tutorial here). Okay guys, heat your ovens. Let’s bake! And eat! And share! 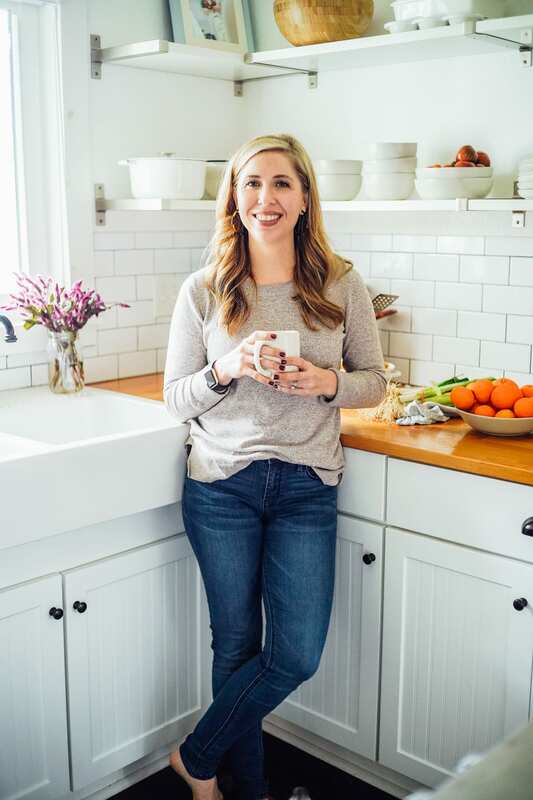 With a desire to keep our food as unprocessed as possible, I’ve been working on reinventing classic Christmas cookies so I can pass the recipes (and memories) down to my children. 8 TB butter softened at room temperature--I've used both KerryGold salted and unsalted with good success. 1/2 cup organic white sugar "Evaporated Cane Juice Organic Sugar." 1/3 cup honey Use a light-colored honey, like Orange Blossom. In the bowl of a stand-mixer, fitted with the paddle attachment, beat the butter, sugar, and honey together until "whipped." This will take about 40-60 seconds on medium speed. 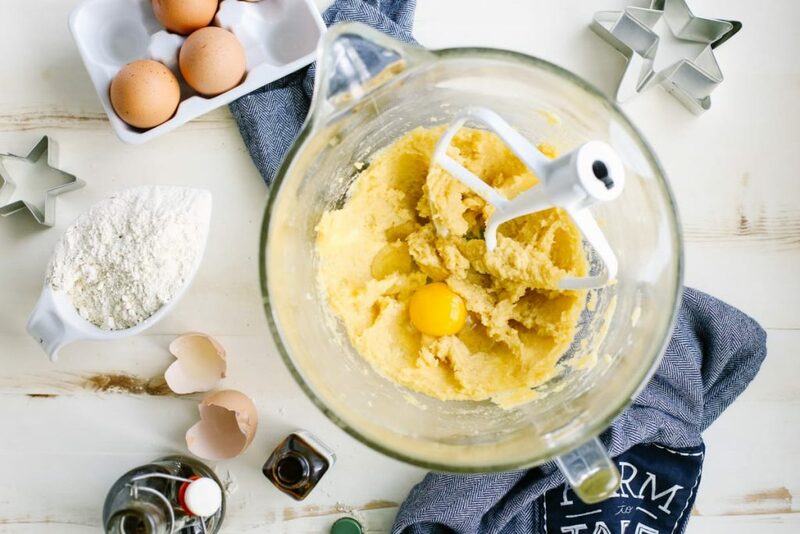 If you don't have a stand-mixer, use a hand-mixer. Add the egg, vanilla extract, and almond extract to the butter/sugar combo. Beat the ingredients to combine for about 30 seconds, scrapping the sides of the bowl if needed. Now it's time to add the dry ingredients to the wet ingredients: einkorn flour, baking powder, and salt. Turn the mixer on low speed (or use a wooden spoon) and combine the dry ingredients into the wet ingredients (about 20-30 seconds). Einkorn doesn't like to be overworked, so only mix the ingredients until combined. Using your hands, form the dough into a ball. Place the dough on a piece of large parchment paper and wrap it up. Refrigerate the dough for 2-24 hours. I usually let my dough rest for two hours for same day baking, and longer if I want to make the dough in advance. After the dough is chilled, remove the ball from the fridge and let it rest for about 5-10 minutes at room temperature, until you can easily roll it out. 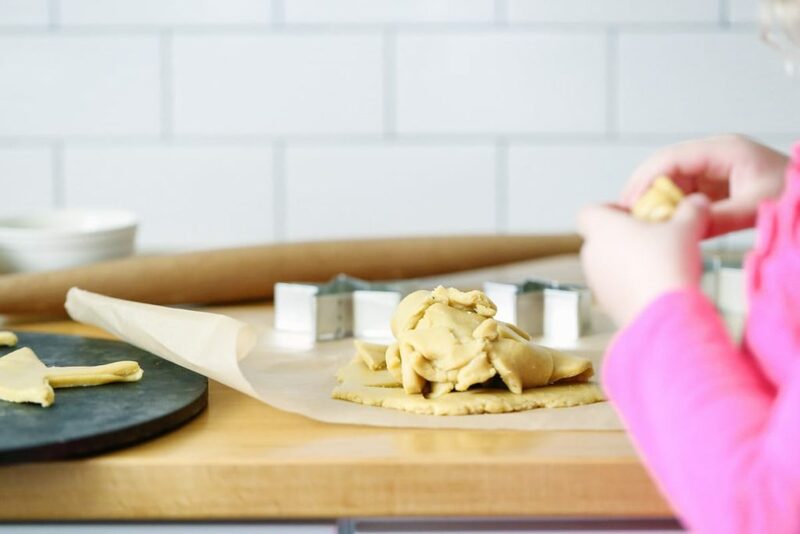 Place another piece of large parchment paper over the top of the ball, then roll the dough out. The parchment paper on the bottom and top of the dough will make for easy cleanup! 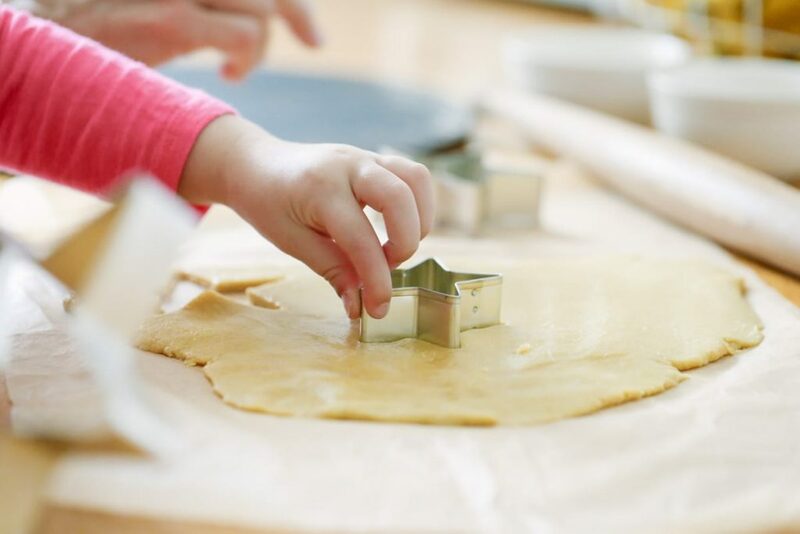 Cut out dough into desired shapes, then bake for 10-12 minutes until the cookies begin to look golden on top. Let the cookies cool on a cooling rack. Choose your topping choice: icing or buttercream. For the icing, combine all the ingredients in a bowl. If your powdered sugar is clumpy (this happens with the organic variety), then sift the powdered sugar first through a sieve. Adjust the powdered sugar or milk as needed, by a tablespoon at a time until you reach the desired icing consistency. For the buttercream, add the butter and powdered sugar (keep the sifting note above in mind) to the bowl of a stand-mixer, fitted with the whisk attachment. Whisk together the sugar and butter on low speed until combined. Then add the vanilla and milk and whisk just until combined. Add more powdered sugar as needed, a tablespoon at a time, until you reach the desired consistency and taste. Separate the frosting in individual bowls and mix the icing or frosting with your natural dye (see my note about natural dye in the story above). Enjoy immediately, or store the cookies in the fridge or freezer. If you need gluten-free sugar cookies, I recommend using Renee’s recipe (from Raising Generation Nourished). These look awesome! What kind of sprinkles did you use? Thanks, Amanda, they are really easy and delicious :). I used sprinkles from India Tree (same as the food coloring). I purchased the sprinkles at Whole Foods, too. Do you think sprouted whole wheat flour would work ok in this recipe instead of einkorn? Hey homebody, I’m not sure. The cookies may be a bit dense with the sprouted whole wheat. You could try reducing the whole wheat down to 2 1/2 cups. If you have whole wheat pastry flour that may work better. Thanks for the suggestion, I’ll try that. 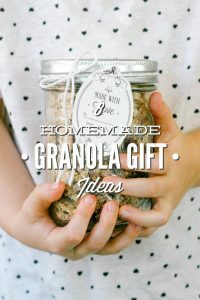 How would you suggest making these gluten free? 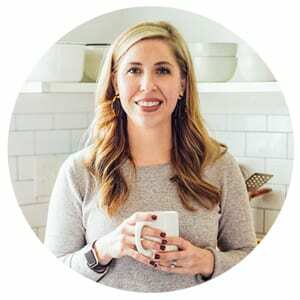 Hey Krista, There’s a link for a gluten-free recipe at the bottom of the recipe :): http://www.raisinggenerationnourished.com/2015/12/gluten-free-sugar-cookie-cut-outs/. Enjoy!! 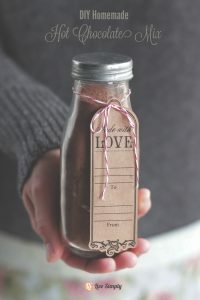 Could I use spelt flour? I have a lot of that. They look so good! Thx for sharing the recipe!! Hey Katie, I think spelt will work. You’ll probably need to decrease the flour amount to 2 1/3 or 2 1/2 cups. I made these today with spelt flour, and they were delicious. I doubled the recipe, so I could save some dough in the fridge to make more in a few days. Also, we made the icing and I used a little (maybe 1/2 tsp) pickled beet liquid to make the icing pink. It worked great and didn’t taste at all like beets. That’s fantastic, Liz! Thank you for sharing. Merry Christmas! 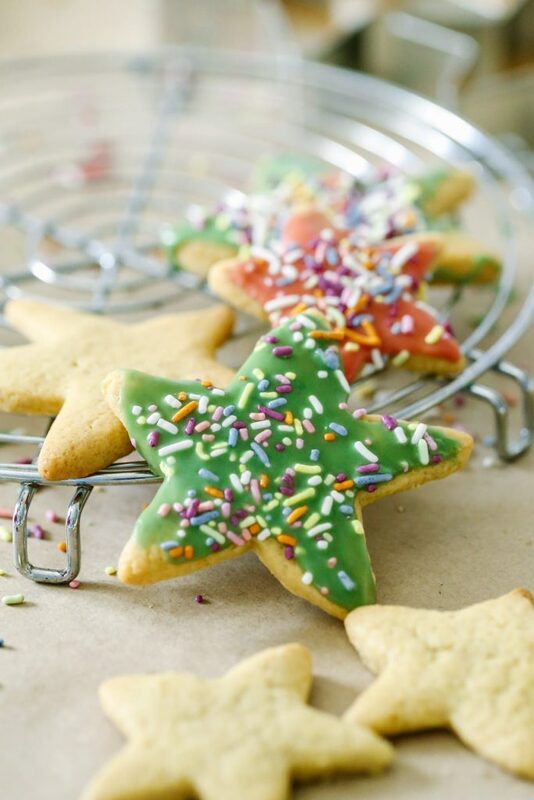 the classic star shape, and the yummy looking food colors, so loveable.